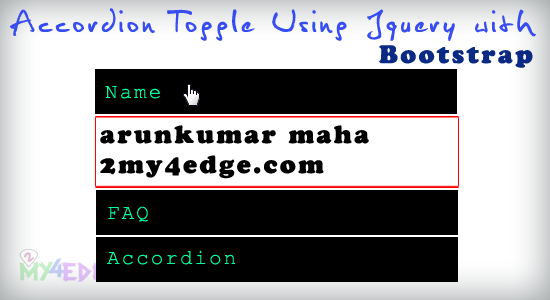 Accordion toggle is new style of toggle, this accordion is mostly using for FAQ and design features, so this kind of toggle is make the web page as very attractive, and here we are going to use this with Bootstrap plugin. let see the coding. class="accordion-heading" is for heading of the accordion, and the data-parent is the ID of the main Id of the accordion. the above i'm indicated with this color. the above bootstrap and jquery min files are important. that is it. An accordion is ready. i hope this is very usefull to every one. Instead of clicking, can you modify it to work with mouse over event? Nice article and you are sharing a wonderful information to the readers. I would like to thank you for sharing this good article.